The game started not long after a heavy rain had passed through the area. Turning the grass field into a field of mud. Keystone opened the scoring with a touchdown and a two-point conversion. Union/ACV, though, found their offense, and scored two of their own in the second to take a thin 12-8 lead into halftime. With the field conditions descending into chaos. The surface may have looked grassy, but the mud made for horrible footing. Slipping and sliding was common. And neither team could score the rest of the way. It was a relatively short drive home and then heading west to Cleveland on Friday afternoon. Like the Pittsburgh City League had done in years past, the Senate Athletic League, comprised of the ten Cleveland Metropolitan School District football teams, plays primarily on Friday afternoons. The Cleveland Browns had donated money to the city schools to install field turf at several of the stadiums in the city. In the not-so-distant past, the Senate League was only hosting games at three sites: Collinwood, JFK and Rhodes. Collinwood being the ‘state of the art’ location that included lights for night games. With 11 schools at the time (Whitney Young has since ended their independent football program), they had games on Thursday afternoon, Thursday night, Friday afternoon, and Saturday at noon. The reason was one of the venues wasn’t safe for play (Bump Taylor Field), and John Marshall’s field was converted to a parking lot during reconstruction of the school. Now, with Bump Taylor’s stadium being fixed, and the influx of money, the CMSD put turf into the two fields without it (Rhodes and JFK), and reinvigorated John Marshall’s stadium with a new playing surface. 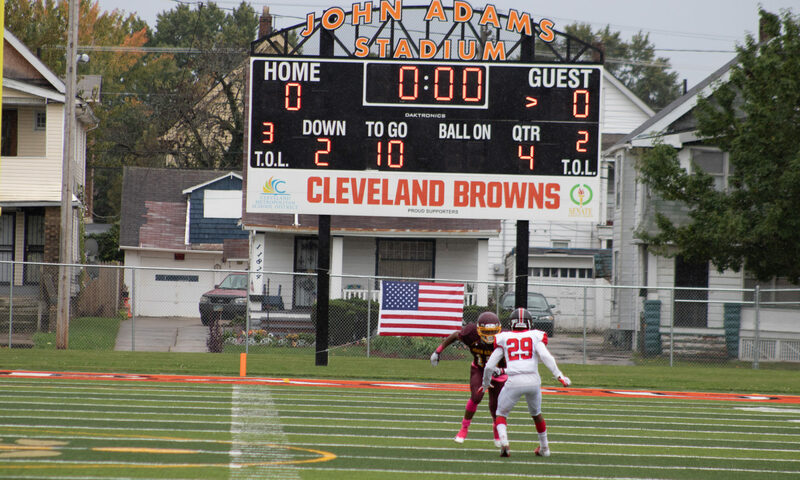 And lastly, John Adams, located on the East Side, just west of JFK High School, received a turf field and a small, simply bleacher setup and scoreboard to host their own games. Three games, total, on the schedule. The stadium does not have lights. And games there were scheduled for 4 or 3pm, depending on how late into the year they were played. This game wasn’t expected to be much. Glenville was a big favorite, visiting John Adams Stadium for the first time. The perennial stalwart of the Senate Athletic League, the Tarblooders jumped out to an early lead as a steady, light rain fell. The Tarblooders opened up the second half with two more scores, and after a kickoff return for the Rebels, held a commanding 39-12 lead with 12 minutes to go. The scoreboard seemed to malfunction, as time was then kept on the field. And the PA system eventually stopped working, as well. The game ended on a John Adams touchdown on what appeared to be the final play. It seemed awfully fast, but without a scoreboard clock, it was hard to follow the time remaining. After the handshake line finished, a brawl broke open along the bleachers and John Adams sideline. Involving numerous players from each side. I left there quickly, as I had plans for another game. I wanted to make the drive to Burton, for the Berkshire-Richmond Heights game. However, Richmond Heights had walked away from a game earlier this season against Kirtland after being down 14-0 and suffering two injuries. Fearing the worst, the coaches called it a day. Also, it was a bit of a drive and that delayed fourth quarter of the early game made me start to rethink my option. And of the games I checked locally and projected finishes, I had a few choices. I picked Independence hosting Middlefield Cardinal. Independence is a small suburban community just south of Cleveland along the Cuyahoga Valley and I-77. It sits just south of the I-480 Outer Belt. It’s actually a small area, which makes it a small school. But a school with some finances, given the style and construction of the school and surrounding fields and stadiums. The final score of this game may not show it, but this was a defensive battle. The first frame was scoreless. After Cardinal’s offensive touchdown, Independence answered with a kickoff return to take a 7-6 lead. And then, returning Cardinal’s fumble 68 yards for another touchdown. Cardinal’s offense was stymied for much of the game. Only breaking through when they were down three scores late. The next day was a return trip to Ohio. This weekend was an odd weekend for games. In Pennsylvania, there was only one western Saturday night game. That being Erie hosting Canisius. 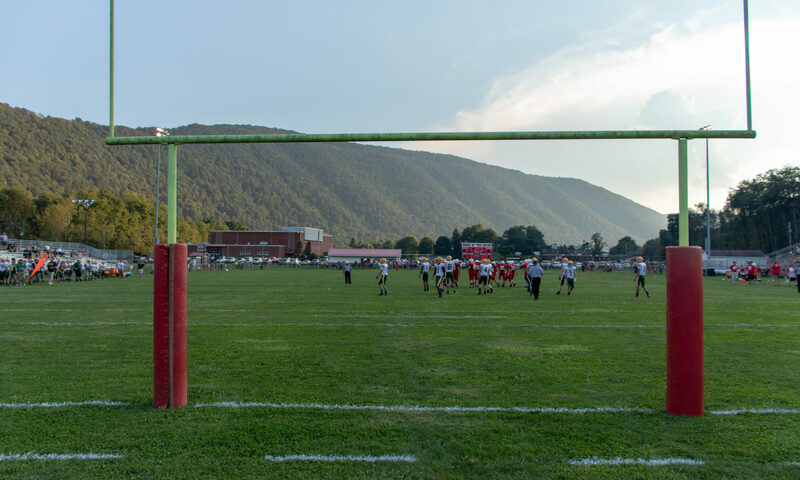 Northgate and Port Allegany both had Saturday afternoon games. Port Allegany’s at the unworkable 2pm game to go with Erie’s 7pm game. There was a New York game in Clymer at 1:30pm. But a much longer drive and greater chance of rain. My original plan was to head to Crestline just west of Mansfield. They were hosting an odd Saturday afternoon game at 3pm against Ashtabula St. John. Matching that with a night game would be tough. There were other afternoon games, such as Cleveland Benedictine hosting NDCL, or Lakewood St. Edward hosting Indianapolis Cathedral (IN). Also, Akron Kenmore-Garfield had a regular noon game against Akron Buchtel. But, to see Crestline meant the closest option was Sandusky, at Cedar Point Stadium, between St. Mary Central Catholic and Gibsonburg. A late start had already put Northgate, Summit Academy, Port Allegany and even Clymer (NY) out of reach. Akron wasn’t interesting to me. And Crestline was going to be one-sided. And with the regular threat of rain, I decided to stick closer to home. A night game at Poland’s Dave Pavlansky Field between Valley Christian and Rootstown. But, that made Crestline impossible with the 3pm kickoff. So, there was one other option. Well, two. But I wasn’t going back to University School for a matchup with Parma. Someplace new was a few miles up OH91 to Gilmour Academy, who was hosting Cleveland Central Catholic. The rain forecast kept moving to the north, and it looked like most, if not all, of the game could avoid the rain. This game wasn’t expected to be competitive. But, it was a chance to see a few new teams and a new stadium. A private school that regularly plays 2pm kickoffs. Getting there, it was my second game of the weekend without a working scoreboard. A telltale step ladder setup behind it signifying they were at least trying to get it working. The PA system itself wasn’t that good, either. Gilmour Academy’s No. 13 C.J. Charleston was their workhorse. At least three TDs just in the second quarter. As the Lancers moved out to a 35-6 lead. The second half was an attempt to beat the rain. Forecast to hit at 4:15. A third quarter touchdown started the running clock, and the storm started rolling across the lake to the north. After that, it was almost 3 hours until the kickoff at Poland. I’d been to Poland for a Youngstown Christian game, but not since they had renamed themselves as Valley Christian. The matchup wasn’t exactly one I was enthusiastic about seeing, but it was projected to be a decent game and I’d be home in about fifteen minutes. So, there were benefits. Especially considering my original plan was St. Mary Central Catholic whose game would endure several hours of lightning delays before being postponed until Sunday and moving to Huron High School with a 2pm kickoff. That wouldn’t work, as I was headed to the Browns game. After two period, it was a bit of a slug fest. but, Rootstown was making the plays to move the ball and got a slim touchdown lead at the half. Rootstown pulled away in the second half, extending it to a 30-8 lead halfway through the fourth. But, the Eagles weren’t going to stay down, and almost immediately with a 30 yard touchdown to make the final five minutes interesting. Rootstown ate up the rest of the clock and walked off with the win. For a weekend where most nothing went as planned, it was a good weekend. For the bad weather, I got five games in without any rain. Not the match-ups I was expecting to attend. So far, in 2018 I’ve been to 19 new stadiums and have seen 38 new teams. Only one team have I seen twice, that being Brashear. Meaning 83 different teams for 42 total games in 32 different stadiums. Rootstown was the 976th different team I’ve seen play. And Weber Stadium in Gates Mills was the 281st different stadium I’ve attended games. And my Saturday night game was my 865th, all-time. Photos from this week can be found HERE.